I sit on a mat, laughing at some joke one of my singing class partners has made. We have just finished learning a difficult composition and are taking a break, recounting funny incidents related to music. I have attended plenty of classes in the past 14 years of my life, but my favourite one has to be my music class. This is because of my teacher’s unique approach to teaching. For example, learning by observation is greatly encouraged in our music class. Children of lower batches listen to kids at higher levels to get a feel of what is being taught. Listening to music is an amazing way to assimilate difficult passages and then emulate them. It lays a deep foundation of the music firmly in the mind, which enhances the child’s abilities and hastens the learning process. As a result, when someone is learning a similar song, they grasp it more easily. This approach accomplishes a lot in a single session. Music theory, which is included as part of our class, could be fun facts about ragas, composers and great musicians, which is interspersed with the actual singing. The good thing about this is that because of the way in which it is taught, we don’t forget what we’re told for a very long time indeed. This also drives home the fact that it is not enough to learn how to sing something, one must also understand how the composition came about. Our teacher is one of the best as well. She doesn’t get irritated or annoyed if we make mistakes; in fact she encourages them – which brings me to my next point. The way we are taught, mistakes are small hurdles to cross; which ultimately make us better at the song and helps target our personal weaknesses. This leads to a positive atmosphere where children are aware they might be making a mistake but make it anyway. An important outcome of this is that children keep asking until they’re sure they are completely right about what they are singing. They want to make sure that they are singing correctly – hoping this will lead to better singing. It also helps our teacher who then has a better understanding of our weaknesses and strengths. A fact which is reiterated time and again is that no one’s singing is perfect. Even the greatest musicians have made mistakes. This humbles all of us. It makes us realize how far we need to go and that even if we reach there, we are expected to refine and polish everything we have already refined and polished many times over. We will never truly be without mistakes, which is a thought that should be kept in mind for almost everything we do. Another characteristic feature is that we aren’t pushed towards anything or pressured to become professionals. We have both parents as well as the tutor to thank for this. In a dog-eat-dog world like ours, one feels that to amount to anything, you have to start learning immediately and start performing immediately after. But in our class, it is not forgotten that singing is a form of relief, a stress buster or just pure enjoyment. Of course, if someone wanted to become a professional classical musician, it would be encouraged. But the whole point here is that it is that person’s choice whether or not to become a singer – it isn’t forced upon them. Due to this, the tension that would be present if we were all expected to sit on the stage someday is non-existent. Everyone is always friendly to each other and we have lots of fun without competing with each other. Our teacher encourages listening to Carnatic music as much as possible apart from our regular classes in order to have a continuous learning process. Children are also encouraged to share among themselves what they listened to, what they liked about it, and why. These reasons are mainly to back up the real essence of this article; a class becomes what it is not only by how good the pupils are or how good the teaching is but also the way things are taught. And I am lucky enough to be able to say that one of my classes has not only the former but also the latter. The author is a student of class 9 of National Public School, HSR Layout, Bangalore. 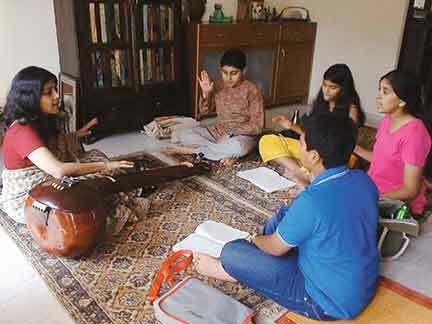 She has been learning Carnatic vocal and the piano for some time now. She is also interested in reading, writing, math and all kinds of sports activities. She can be reached at raji.rama@hotmail.com or ramalingam.ramya@gmail.com.